My fourth grand-uncle Josef Stoltz, together with a group of German immigrants who served in the Civil War, set up a cemetery and constructed the first Catholic church in Wright County, Minnesota. As far as I can tell, the bell they bought still rings from the third Church of St. Peter in Delano, Minnesota. I’ve posted before about the 1852 arrival in the United States of my 3x great-grandparents Jakob Stoltz (12 Nov 1814-14 Mar 1888) and Magdalena Franziska (Bummer) Stoltz (8 Mar 1815-4 Nov 1893) from the German village Berg. They brought with them their three children: my great-great-grandfather Peter Stoltz (31 Oct 1836-6 Aug 1921), his brother Anton Stoltz (24 Dec 1839-21 Dec 1876) and his sister Barbara (24 Mar 1841-21 Jan 1932). All of them, born in Berg, would die in Saint Paul, Minnesota. But Jakob and his family were likely accompanied by his brother Josef Stoltz (7 Jul 1819-30 Apr 1885) and his wife Katarina Barbara Stephany (8 Dec 1823-23 Jun 1857) and their children Franz Josef “Frank,” Margaretha (who married George Washington Kreidler), Valentin (who would serve in the Civil War), Katherine Agatha (who would marry John Johnson), and Caroline. Poor Caroline would die at sea in July 1852 on the journey to America, less than a year old. Josef and Katarina would have a son and a daughter in Cincinnati, Adam and Veronica. Both lived only a few months. Their last son, Philip, would be born in Saint Paul and also lived only a few months. In many ways, the New World held so much sorrow for them, but even this was better than what they left behind in Germany. Jakob and Josef were the eighth and tenth of the 11 children of Alois (10 Jul 1782-19 Jul 1852) and Maria Barbara (Knöll) Stoltz (~1773-1 Feb 1848). Six of their children have no recorded death dates (at least that I could find) in the parish records of the Church of St. Bartholomew in Berg. At least one older son, Johann, lived in Berg until 1866. So when their father Alois dies in July 1852 (their mother having died already in 1848), it may have been that Jakob and Josef had no future in Berg. Their older brother Johann would have inherited the land the Stoltz farmers owned or leased, and if any of the other older brothers Franz, Christian or Peter had survived, they would have partitioned the land even further, possibly even threatening their own survival. Josef and Katarina had married in Berg on 16 May 1847. They already had three children together before being married, including a son, Adam, born 24 Oct 1841 who would live only until April 1843. 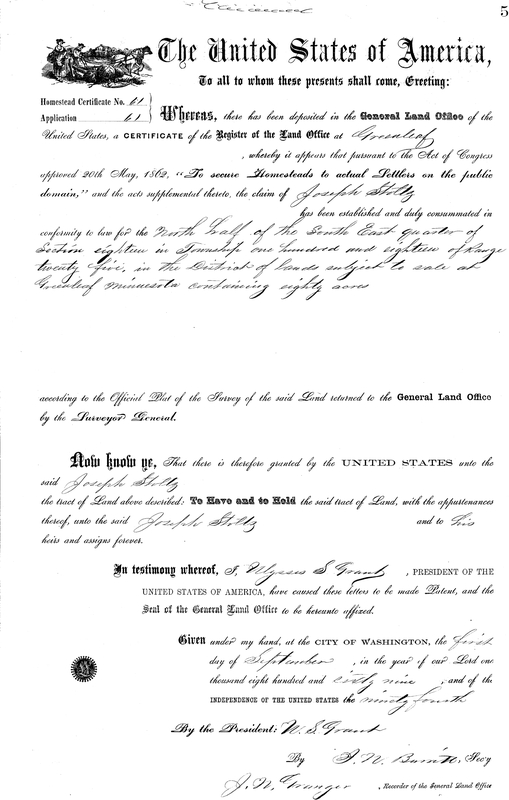 The original patents to land in Wright county, upon which all subsequent deeds and transfers are based, were obtained in four ways: under the pre-emption act, under the homestead law, under the townsite act, and from the railroads. The first settlers obtained their homes under title i) re-emption act, by the provisions of which they were required to make certain improvements, to live upon their land a certain length of time, and to pay $1.25 an acre. There were certain restrictions as to the size of the claim and as to the eligibility of those who filed. Instead of paying money the settlers often paid soldiers’ script which they had purchased at a discount. This script had been issued to soldiers, entitling each veteran to a certain number of acres free. Few of the soldiers ever used this script to obtain land, and thousands of these papers fell into the hands of speculators, by whom they were sold to settlers. Under the homestead act, which replaced the pre-emption act, the government issued a patent after a person had lived on an eighth or quarter section (according to location) for a certain period, and made certain improvements. Many of the people obtained their land from the railroads, who had a land grant of each alternate township along their improved rights- of-way. There was also a townsite act under which villages could be entered, platted, and lots sold. 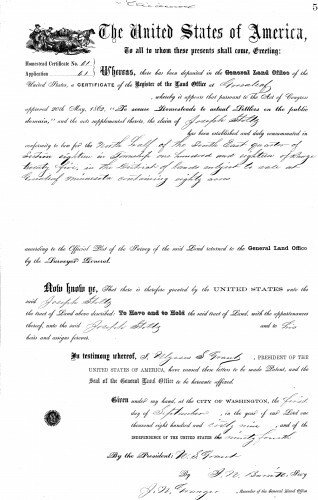 The following transcriptions from the land office records gives the original owners of all the land pre-empted and homesteaded in Wright county. This is the roll of honor of those who dared the rigors of a pioneer country and started the first developments. The list is in the main accurate, though, through carelessness of the land office registers and their clerks, the original entries are often misspelled, and transcriptions of more or less illegible hand- writing since that date have distorted some of the names in various ways. But especial efforts have been made to insure accuracy in this printed list, and the names of thousands of old pioneers will be recognized. A few of the original claimants are still living, and many families are still residing on the original claim of their father or grandfather. For the most part, however, the original claimants moved away, on account of Indians, grasshoppers and hard times. In the following list, where a person’s farm lay in several sections, or where a second claim was later taken in another section, only the first section of the first filing is given, except in special cases, for a constant repetition of names would needlessly cumber the rolls. …Joseph Stoltz was born in Bavaria, Germany, and there married Catherine Stephanie. In 1852 he brought his family to America and settled in Cincinnati, Ohio. In 1855 they came to St. Paul, and in 1861 settled on eighty acres of woodland on the shores of Fountain Lake, in Franklin Township, this county. Mrs. Stoltz died June 23, 1857, and is buried in Calvary cemetery, St. Paul. In the Stoltz family there were nine children: Martin was born October 24, 1841, and died in April, 1843; Frank was born in 1844; Margaretha was born February 10,1847; Valentine was born August 9, 1848; Agatha was born November 26, 1849 ; Caroline was born September 7, 1851, and died on the Atlantic ocean en route for the United States in July, 1852; Adam was born January 6, 1853 and died August 4 of the same year; Veronica was born April 7, 1854, and died July 9 the same year; Philip was born May 28, 1857, and died July 6 of the same year. After the death of his first wife, Mr. Stoltz married Mary Stumpf, a widow, and to this union there was born one child, Eloisa, born August 18, 1858, and died July 23, 1860. Joseph Stoltz died April 30, 1885, and is buried at Watertown, Minn. In 1856 Joseph Matter and some of his brothers and countrymen arrived and settled on the land between one and three miles west of Delano. He could never tire telling how he and his brothers aid his old friend Mathias Schaust used to cut the stoutest oaks, elms and maples, roll them in a pile and burn them, so that for weeks and months a smoky, hazy atmosphere enveloped the old thick woods, prophesying to them their ultimate destruction. But in the midst of all this fire and smoke these hardy settlers felt contented and happy, looking hopefully into future, knowing that they selected a rich country- for their home. In 1864 the two-year-old baby, Joseph, son of Joseph Matter, died. 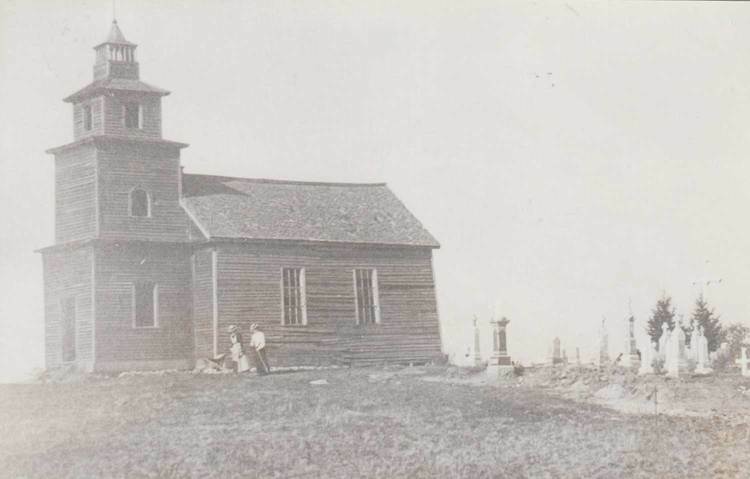 The father did not like to take him to Chaska or Minneapolis for burial so he decided to bury him on an elevated knoll in his wheat field, and thus, not knowing, started the present cemetery of this congregation. 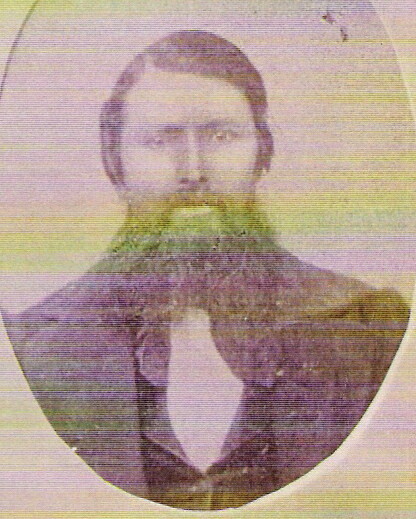 Joseph Matter and his neighbors were in the Civil war. Returning in 1865 they made up their minds to build a church. These pioneers were men of word and acts. not losing much time with plans and style of architecture. Joseph Matter, with his brothers. 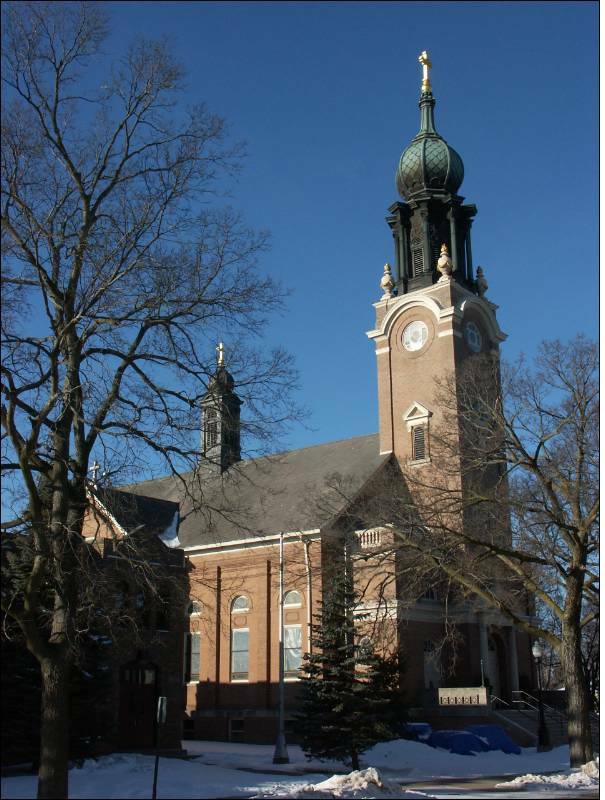 Louis, Philipp, John and Anthony, and Mathias Schaust, Joseph Baumann, Andrew Oehrlein, John Kiichenmeister, John Muckenhirn, Joseph Stolz and Mike Brenner, started with the work and erected the first Catholic church building on our cemetery. In 1869 they bought a bell, paying $200 for it. I was filled with sentimental thoughts when in 1901 I had to tear down the old venerable structure and so to obliterate a monument of the early religions zeal of our pioneers. But I could not prevail against myself to remove the belfry with its sweet sound. Josef Stoltz is my 4th great-uncle. Great family history–good research job. Thank you for sharing.